When looking for an effective and easy to follow project management method, what are the things you pay attention to? "How quickly can I implement this? ", "How will it increase my productivity and what will it change in the work environment? ", "How much time will following it take?" If these are your priorities when choosing a project management software, you will greatly benefit from considering Kanban. Strongly associated with Agile environments, Kanban has been prooven to bring positive changes to non-Agile environments as well - please take a look at the study on "Agile projects in a non-agile environment". Kanban is a very successful and easy method of organizing and following workflow. The idea behind Kanban is to divide the work process into stages (basic stages would be: to do, doing, done), This division enables you to visualize the workflow, and therefore to minimize the time each team member needs to spend analyzing the workflow in order to see the state of it. The other step is making sure that all team members are following a prescribed work in progress limit (one or two items at a time), to make sure that they can fully focus on their task, rather than try to complete any number of jobs simultaneously. The approach of doing only one task at a time promotes focus and diligence, allows for productivity and quality increase and helps to create a less chaotic work environment. Traditionally, Kanban users have been writing tasks on sticky notes and pasting them onto a whiteboard, moving from stage to stage as the work was getting ahead. That's all good, but it only informs the employees that do come into the office and stay there. In order to allow more flexibility for your team (people working from home or attending business meetings in the city) - the perfect project management solution is an online Kanban board. Available form anywhere and any time of week, day or night, simply opened in a web browser on a computer, a tablet or a smartphone - a Kanban Tool board will make your team's collaboration in real-time very easy and enjoyable. 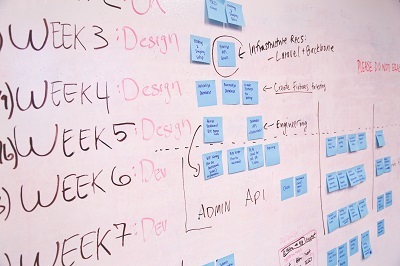 There are numerous benefits of using Kanban Tool for your online project management. Not only will your team be able to access the workflow any time and from anywhere, it will also be clear to see who is doing what at any given time and who has been causing any impediments or great improvements. Kanban Tool also provides extensive Analytics, allowing to track the actual progress and productivity statistics (together with seamless Time Tracking and a detailed Time Report). - How much time will following it take? - as soon as your team gets into a habit of looking at the board, these are matters of seconds - changing task status and pulling new tasks to a "doing" column. The best way to get started right away is signing up for the free trial. Find out how simple it is to use Kanban Tool - you've got nothing to lose and lots to gain!